Author: Ilene S. Cohen PhD. 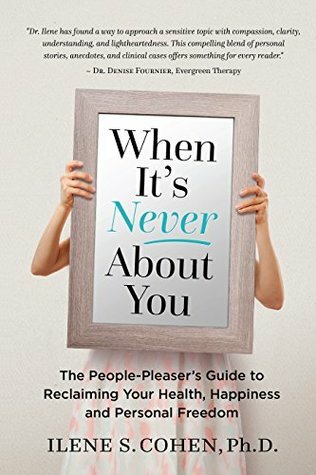 Dr Cohen would like readers of her book When Its’ Never About You to recognise the difference between selfish and self-full (the median between selfishness and selflessness). Dr Ilene recounts parts of her personal journey when she equated being good and selfless to being an over-functioner. Simply put, “over-functioning is taking on other people’s responsibilities and not holding them accountable for their participation in the relationship system”. However, she quickly bore the consequences through burn-out, strained relationships and deteriorating mental health. Based on her own life experience as an “over-functioner”, Cohen illustrates how she was able to regain a strong and balanced sense of self while still being a good person. She anchors her book on Dr Murray Brown’s family systems theory which posits that people should not be understood in isolation from one another, rather as a part of their families of origin. Meaning that individuals should be viewed as confluences of the various influences on their lives, From the people-pleasers’ perspective, the should be seen from the over-functioning role that they have taken up in their social circles. If you are a keen reader of the blog, Yes and Yes, you will have come across this recent post on self-care versus self-sabotage which is quite similar to Dr Ilene’s self-full vs selfish theory. It is quite clear that sometimes we do things intentionally to harm ourselves under the guise of “self-care” such as binge-watching tv shows, eating lots of unhealthy comfort food with no exercise plan in the near future and even avoiding those necessary but difficult conversations which lead us to self-sabotage. “A big part of mental health is feeling at home with your emotions, knowing that you will not have to avoid feelings or numb them, but knowing that you have the emotional flexibility and emotional resilience to feel safe with yourself” – Robin Berman M.D. Having said all of the above, it is important to note that guilt is a part of our inner selves that is supposed to nudge us to do the right thing but it does bog us down and eventually turns to shame. For people pleasers, this is especially weighty and might terribly affect their mental health. The book does provide some helpful tips on how to draw boundaries so that you will not appear selfish but a self-full person and even end up garnering respect from the people that you interact with. She also asks people-pleasers to know that avoiding situations that challenge will impede the growth of your self-confidence muscle as well the people that you constantly swoop in to rescue. Dr Ilene does quote extensively from psychological studies but she is able to break down the findings in an applicable way starting with using illustrations from her own life. At the end of every chapter, the reader will be asked to reflect through a number of exercises that are supposed to help him or she identify harmful behaviour patterns that prevent from being heard, listened to and respected. Hence, even though the book is less than 200 pages (without the bibliography), it can’t be rushed. If you are familiar with Gretchen Rubin’s The Four Tendencies framework, you will enjoy this slim volume since it dives deeper into the “Obliger” psyche. Nonetheless, When’s its Never About You is for anyone who wants to establish boundaries in their relationships and need a nudge to have difficult conversations. Editorial Note: This book was kindly sent to me by the author in exchange for an honest review.